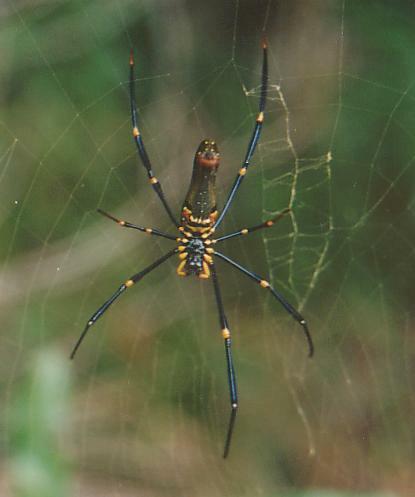 The 'Golden Orb Web Spiders', Nephila spp. are among the largest of the spiders to build aerial webs. They sit in the middle of their large 'orb' or circular shaped web usually with their legs spread out and head pointing downwards. The abdomen is elongated and often decorated with blacks, yellows and whites. These spiders are referred to as a 'golden orb web' not because of the colours sometimes found on the spider (that can include golden yellows), but because, at the right angle, the yellow silk of the web takes on a very delicate golden colour. Unlike many spiders, they often leave their web for some time, merely effecting regular repairs. They can do this because their web of yellow silk is one of the strongest amongst the spiders (Preston-Mafham and Preston-Mafham 1998). This is probably a reflection of the large size of much of the prey they capture, for even the remains of birds have been recorded in their webs (Raven 2000). Most specimens of Golden Orb Web spiders observed are the females. This is because the Nephila genus has the biggest size difference between females and males of any spiders, with the tiny males sometimes being seen in the web. Golden Orb Web Spiders are very common in the Daintree, especially after some summer rain, and can be seen on Marrdja boardwalk and around the toilets at Cape Tribulation.